“How do you study one of the world’s fiercest predators in the wild?” the cover of the “Expedition Great White” DVD screener that National Geographic sent me asked. I was delighted to discover that my sarcastic answer of “very carefully” is exactly what the back cover of the DVD case read! I knew I was going to like this show from that point on, and I was right. 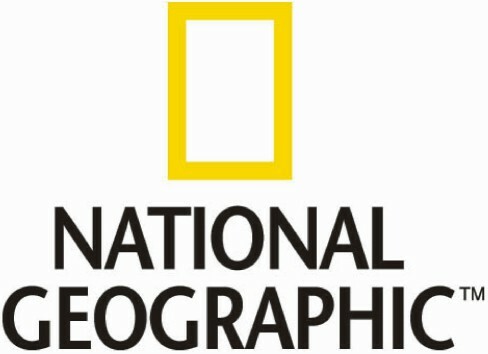 Expedition Great White, which premieres this coming Sunday on the National Geographic channel, is a different kind of shark documentary. Instead of focusing on shark attacks, it follows the adventures of scientist Michael Domeier and his team of expert anglers (which for some reason includes actor Paul Walker) as they attempt to study great white sharks in the wild. Unlike “Shark Week”, the drama on Expedition Great White doesn’t come from re-enactments of sharks attacking people. The drama comes from trying to get important data that researchers hope to use to protect this endangered species, and from the real-life struggles facing scientists who work in the field with rare animals. For a while, they only find male sharks while they are hoping for females. Gear malfunctions. A shark gets stuck and they struggle to free it. The Mexican police board their vessel and turned back only after being bribed with cigarettes and fresh fruit. Everyone celebrates when a blood sample is drawn from a great white for the first time. No human is injured in the course of the show, and the people I watched it with still couldn’t look away. Science is all about telling a story, and this show demonstrates that real science stories can be as compelling as artificial hype. Throughout the three episodes that I watched, the team showed respect bordering on reverence for the sharks, and they continually tried their hardest to avoid harming them. Dr. Domeier also attempts to draw blood from adult females to run hormone assays. He suspects that Guadelupe Island is a site where great whites go to mate, which would have important management consequences if true. No mating site for great whites has even been identified, and this is the first time that blood has been drawn from a great white. The methods used to draw blood were the only part of this series that I wasn’t thrilled with. After catching the sharks, they are lifted out of the water using a modified forklift so that people can easily immobilize them, attach tags, and draw blood. There are some problems associated with this technique, which has already been the subject of a great deal of controversy. While I regularly take sharks out of the water for my research, I don’t ever mess with anything larger than 5 or 6 feet. In addition to the human safety factor, animals larger than that may be too heavy for their cartilaginous skeletons to support their weight without water’s buoyancy. The white sharks Dr. Domeier removed from the water were 14-18 feet long. The narrator of this series constantly repeated that “as long as the sharks are back in the water within 20 minutes they’ll be fine”. Seeing as this is the first time those methods have been used on sharks this size, I’m going to have to call shenanigans on that 20 minutes figure since we just don’t know that. That said, all of the sharks shown in the series seemed to swim away fine and the crew took great care of them while they were out of the water. This even led to an amusing and touching moment when one of the expert fisherman hired to catch the sharks described how they “go from trying to conquer this beast and break it’s will to caring for it like a baby”. I’m not sure how I feel about this technique. I think that the data Dr. Domeier is trying to get can only be obtained by immobilizing a shark, something that isn’t possible while it’s in the water. That data has important management consequences which can benefit the species. However, experimenting with new and possibly harmful methods on an endangered species seems unwise. I’ve contacted Dr. Domeier and asked for a statement on this issue, and I’ll keep everyone posted. In the meantime, watch this excellent show and decide for yourself. UPDATE: Dr. Domeier and his colleague Nicole Lucas have answered my questions. They also wanted me to point out that their website has an FAQ page about this technique, which can be found here. Thanks for posting this. I’m watching the show now and was just reading about the controversy surrounding the ways the samples are obtained. I was actually going to get in touch to ask you your opinion, so this is perfect. 🙂 I look forward to hearing what you thought about the show! The blood drawing was particularly interesting, especially when the difficulty in obtaining the sample varied from shark to shark. I enjoyed the passion for the shark’s well being, and the care they used when getting it onto the platform, making sure it had a way to escape. Nail-biting tension throughout the episodes. I caught this last year midway thru the show.. I made SURE to set the recorder this year so I could peat, REpeat, and then THREEpeat watching it. GREAT planning, execution, and delivery on all points. 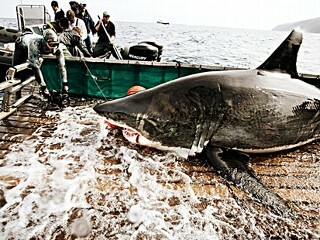 I always wonder if great whites survive after the injuries they suffer during the catch. I have been watching this show for the past few days and I am hooked….pun intended. I have been mixed because of the catching methods, but at the same time the work they are doing is so important and you can tell that they care about the sharks. Pretty funny to see Paul Walker as a deckhand, haha. I really enjoyed this series as i worked on a similar (i think it was the first of the kind) project with white sharks in South Africa in 2003. I fully understand the controvery and concern over the technique, but also think that the benefits FAR outway the risk of injuring an individual shark. It would of course be awful if a shark was harmed, but we experienced a similar pattern to Dr. Domeier ie. all of our sharks appeared to swim away without showing any obvious ill-effects and we also resighted a few individuals around the research boat within the next few days. One of the sharks we tagged in 2003 famously became known as “Nicole” after the satellite tag showed it made an epic round-trip from South Africa to Australia and back again. This was the first confirmation of a “migration” that had been suspected, but never proven and i believe had significant bearing on the white shark being added to Appendix III at the CITES convention in 2004. Before this data was collected, there had been counter arguments against the “migration” theory that the main white shark populations where “resident”, didn’t migrate, and therefor didn’t require protection outwith these local boundaries. I personally strongly support this research method, and hope it hasn’t come too late to save the white shark or any other endangered marine species. Keep up the good work, it’s excellent.